Baby Einstein introduces an all-new format of musical delight for parents and babies to enjoy together! This soon-to-be classic Lullabies and Sweet Dreams Book and CD Set takes your little one on a musical rhyming journey to dream time. Featuring enchanting poetry, the Lullabies and Sweet Dreams Book is filled with colorful illustrations and easy to see type. It's narrated poems take your child to the rainforest, the desert, the beach and more to discover how animals and other things sleep. Whether zebras on the savannah, or children in the city, the soothing Baby Einstein poetry will expose your baby to the concept of sleep and lull him/her into relaxation. Lullabies and Sweet Dreams is sure to become a favorite at bedtime. 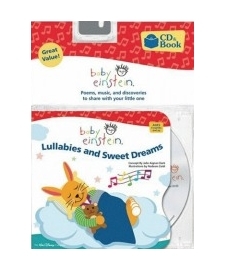 The accompanying Lullabies and Sweet Dreams CD contains narrated versions of the poems in the book, along with enchanting classical melodies re-orchestrated specially for little ears.